Deforestation is a longstanding challenge in Haiti. With only 2 percent of forest cover left, a large portion of fertile topsoil has eroded, hurting agricultural production and thus exacerbating food insecurity on the island. The problem of deforestation in Haiti can be traced to a number of factors. But today’s biggest culprit may be cooking habits. Roughly 94 percent of Haitians use charcoal, with annual consumption amounting to a staggering 1.5 billion kilograms of wood charcoal briquettes. “There is a clear link between high charcoal consumption and low agricultural productivity,” Eric Sorensen, co-founder of U.S.-based nonprofit Carbon Roots International, told Devex. Sorensen and his colleagues at CRI have been working since 2010, after a massive earthquake devastated Haiti, to reverse the trend, but without disrupting the local cooking tradition. They have developed a different kind of charcoal, one that he stresses can save the trees, is cheaper to produce and provides a source of income to locals. Unlike the conventional cooking briquette, “green charcoal” doesn’t come from wood but from charred agricultural waste such as sugar cane bagasse, which is highly abundant in Haiti. 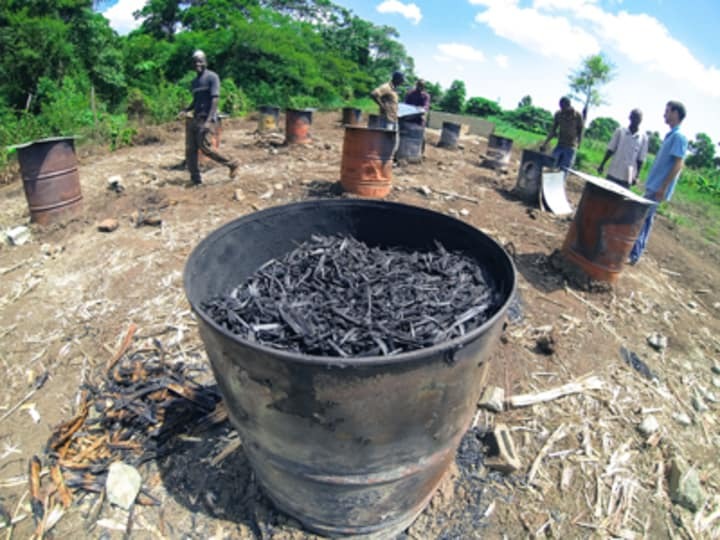 Carbon Roots International trains farmers and entrepreneurs to char the feedstock through locally sourced barrel kilns, buys the charred material, and compresses it through hydrolic presses to transform it into green charcoal. The charred feedstock, or biochar, has several other uses. It is known to sequester carbon — which helps to mitigate climate change — and can build depleted soil and raise crop yields. The difference in the size of crops on plots applied with biochar from those without is enormous, Biochar Bob, a YouTube celebrity passionate about biochar, found after touring CRI’s project sites. Sorensen and his co-founders initially thought they would find it difficult to build a network of farmers and entrepreneurs to produce biochar, but the financial opportunity that came with it proved to be sufficient motivation. The production capacity of char dust is “rising much quicker than expected,” he told Devex. The question remains, though, whether there will be enough market acceptance of green charcoal. “Cooking culture is difficult to change, and Haitian cooks are widely known as fickle customers,” Sorensen said, stressing that adopting green charcoal doesn’t require new stove techniques; rather, it is another type of charcoal. Currently, CRI is working to improve its briquetting technology, and planning to begin recruiting women and charcoal retailers to expand the product’s use within households. Another target is to get more support from the aid community. In April, CRI won a grant of $100,000 from the U.S. Agency for International Development’s Development Innovation Ventures to establish the first green charcoal production center in northern Haiti. It hopes other global development organizations will support the project by becoming biochar and green charcoal’s early consumers. There’s a huge market beyond Haiti as well, Sorensen noted, since charcoal is widely used in developing countries and nearly all regions produce agricultural waste.